A nice combination of things I thought I really should do came together in this fun little project. 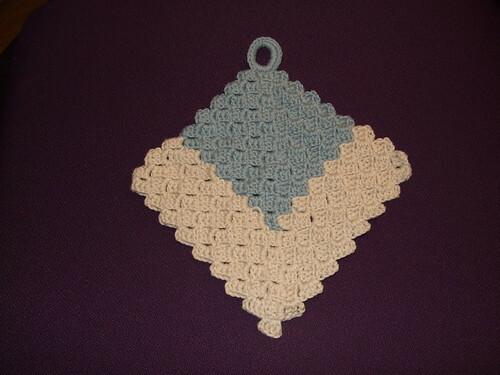 I bought Vintage Crochet at Loop a few weeks ago, and wanted to use it; I’ve been threading hundreds of beads; and I wanted something little to offer to a friend I think would appreciate it. 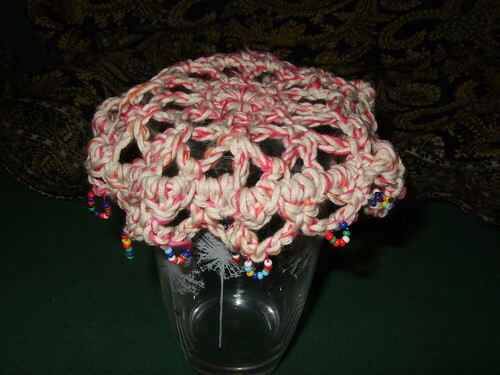 The pattern (for a sugar bowl cover) calls for buttons, or a heavier bead would work well too. These little ones will help the cover hang down the side of the cup or bowl, but mightn’t be enough if used somewhere windy. I still amn’t very skilled with beads, although I like the idea of working with them. I just amn’t very good about wearing them! This book does anticipate rather more enthusiasm than I brought to it today, but it still showcases some really beautiful beaded items (in all methods), mostly from the past, although the guided projects are pretty too. Search Press really do bring out very good books. Part of our responsibility for the new flat is to keep the front hedge in order, and after rather ineffectively hacking at it a couple of weeks I thought I’d read this book for inspiration and instruction, and I really enjoyed the book. It gives ideas and insight without being either patronising or incomprehensible, and does not downplay the value of a plain neatly squared off hedge. It did give me the freedom to try for a little more than that, without having to think I have to get everything perfect first time, so I got stuck in this afternoon. Below are some before and after shots, which aren’t perfectly lined up with each other, unfortunately, but should give an idea of the shapes and amount of growth I was working from, as well as a bit of a sense of my success. 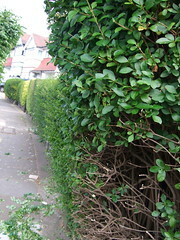 This is the view along the row of houses, with all the other people’s hedges behind. 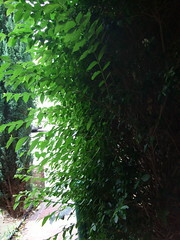 You can see the hole at the bottom where I unfortunately incompetently attacked the bottom of the hedge when I first got my shears. This is taken from nearly the same spot, but looking towards the front door. The second picture is from further up the path, and only shows one door, not both. 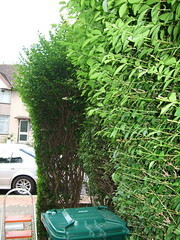 There is purposely an indent in the hedge for the green wheelie bin (into which goes the garden and food waste) to sit and open, which I had already made. And the third, out from the front door. Again, they aren’t from precisely the same angle, but I think this one best shows what I was trying to achieve, with a slightly flared vase effect. 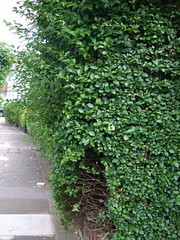 I don’t like it when people’s hedges take up most of the pavement where I’m trying to walk, so I want it to go fairly well straight up to head-height, and then gently arch outwards. 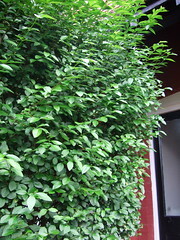 I think that will look nice (and be relatively easy for me to keep in order without needing high ladders). 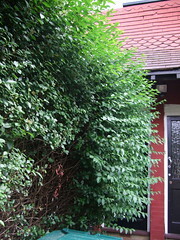 The plan is to leave it alone for a few weeks, to allow for summer growth, settling, and for me to see how it really looks, and then perhaps give it a little trim at the end of the summer to tidy it up and clarify the shape for winter. Hopefully that hole in the front will fill itself out a bit. As you can see, I’m sticking to the same general idea that was there before, but feel I know a little more now than I did before reading the book. It’s Sunday, and I don’t have anywhere I have to be, so I shall finally talk about those days of books! Unlike many such books, this really does mean the World in Medieval times, rather than Europe. Every continent gets at least a few pages, dependent on how much the empires and nations are known to have changed during the timeframe. The book is beautifully illustrated, with hand-drawn maps of the area and empire(s) under discussion on each double-page spread. Each map features small pictures and captions of interesting events and places within the larger area and period, and there is a paragraph or two of general overview on the page as well. There are also a few pages of more general introduction with more text and some photographs as well. One of those books I would surely never have picked up and read cover to cover, but it was worth it, as it’s well written and fascinating. I’m trying to cultivate the sense of being interested in, roughly, everything, while retaining the discrimination to not have to put myself in the way of what will only desensitise me. The history part of the book is not over-sentimentalised, but still brought tears to my eyes when facing up to the sheer scale of death and destruction of individual lives, families and stories. The historical photographs are well chosen and contextualised within the text, and the new (full page) pictures of the cemetaries as they are today are both beautiful and informative, as well as often informative. One thing I did not find out from either the book or the CWGC website is what part, if any, they play in the burial and commemoration of soldiers of more recent conflicts than the First and Second World Wars. Informative and well produced, with an American focus. My mother read Patricia Lynch‘s books when she was a child, then got me some of the reprints when I was, and has now passed on this new biography. The first section is very heavily based on the autobiography, A Storyteller’s Childhood, which to me is the most memorable of the books I read, but I really didn’t know anything about Lynch‘s adult life. I hadn’t realised she was quite so prolific as a children’s author (nor did my mother), – it unfortunately seems she’s out of print – nor that she was so involved in the politics and struggle for women’s suffrage and Irish independence as a young woman. Hopefully this book will awaken enough new interest that some new editions of the books will come out. This one has also made me think again about children’s fiction, but this time books I’ve read far more recently: Chris D’Lacey‘s Icefire series. (Polar Bears, squirrels, hedgehogs and dragons.) (I am purposely not linking first to his own website, as it opens up with noise, which I hate, but now you’re warned, at least.) Anyway real polar bears are fascinating and beautiful in their own right, and this book, as the others in the series, displays and explains them very well. The new author is noticeable in the style of the book, although the structure is the same. When I was a child I thought puffins were young penguins, not a similar but separate species of bird, from the Northern rather than the Southern Hemisphere. (Because of these people, of course.) Anyway, this misconception had previously been cleared up, but I still knew very little about the northern birds, so it’s good to learn more about them. There is one more book on the list already, but I’m leaving that to the next post for a reason. I might even get it up today. Which it is. It’s far more comfortable than either of our beds, and I don’t think I got up from it for at least half an hour. I wasn’t allowed to sleep, unfortunately, but between that and the Pilates class I went to earlier in the evening I’m feeling quite relaxed, if still tired. I got a goodly amount read yesterday and today, and I don’t want to wait another day before giving my reactions to the books. I’ve read Gorillas in the Mist, Dian Fossey‘s autobiography, a few times, years ago, so not much of the actual information in this book was new to me, but the pictures were, and they are informative and well presented in the context of the text. In some ways this feels the more informative as to the structure of Fossey’s life, simply because her own book focuses so much more on the gorillas and the research into them, where this one is about her. This large format tome reproduces a large number and variety of Escher‘s prints, sketches and other works, and introduces them and their artist. There are quotes, mostly by Escher, put in wherever they’re relevant, and I really enjoyed learning about him as an artist. Looking for the trick in his straight landscapes is fun. This pair of beautiful books won’t sound spectacular, but it really really is. They are about the beauty of beetles, and when you see the blown up (full large format page size) photographs you will have to agree beetles can be beautiful, as well as bizarre, and simply fascinating. The introductions, explaining the life of beetles and the history of their collection, are well written and very interesting. This is from the same series as the Francis Drake book I read and discussed about a week ago, but I think it’s much better. The chapters certainly flow far better. She’s a very interesting woman who led a country in major flux. I’m losing coherence. More tomorrow, I hope! I seem to have spent much of the evening threading beads onto yarn for an upcoming project. I’m using a whole variety of colours in random order, even though I’d probably prefer the finished item in one coordinating colour, just because I feel I should use what I have. Anyway, it’s nice mindless work when I’m so tired. In fact, I think I’ll leave off talking about my books of the day, because I doubt I’ll make any sense. Good night. I went to a really lovely wedding tonight, weaving in the last ends on the potholders I made for them just before I left home, so unfortunately I didn’t get around to taking a photo of the complete set. Sorry! I’m very vaguely wondering did I burn off more energy dancing at the wedding then I gained from the very nice meal provided, as I need to lose some weight. I have no intention at all of obsessing about this, however, so don’t expect to hear too much about it. I mentioned the other two volumes in this series the other day, and these are similar in both structure and quality, but just as interesting in their own right. The themes of the double page spreads are well planned, and make sense together. (There is one on Skirts for Men, in the Dresses and Skirts book, and one on Trousers for Women, in the Coats and Trousers book.) There is also a bit of overlap of information, but only where it’s relevant. (Underwear and dress shape over time are closely linked together, for example. Besides working on that scarf this morning, I also spent a bit of time with Irish Crochet Lace: Motifs Collected and Described by Eithne D’arcy so might mix some of those motifs into whatever I work on next. Not entirely sure why I reread this, as while it’s gripping, it’s also disconcerting. Rather better than the run of the mill End Of The World Disaster Stories (and why are they ALWAYS American?) the most thought provoking thing is that many of the signs of panic and trouble are happening anyhow. This book was only published last year, and $5/gallon for vehicle fuel doesn’t look like it’ll be unusual for that long. UK petrol prices are calculated in pence per litre, so not instantly comparable, but they have always been much higher. Food prices are going up and deadly strains of diseases are becoming more common. I could go on, but the book is an interesting take on how one family tries to look after themselves, and in the process draws their line of family (who they will help and support) very close indeed in the bid for survival. Those who try to do otherwise are seen as doing their job, and not to be emulated. I hope we won’t generally come to that in this world. 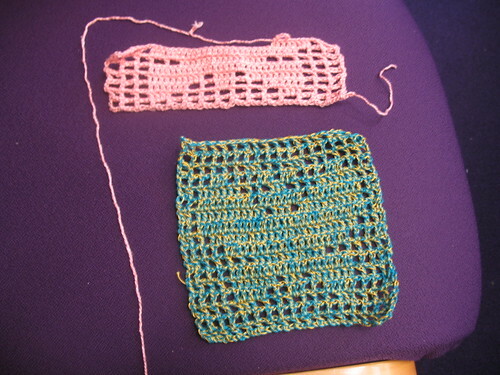 I’m still plugging away at the potholders; I’m onto the fifth one, although the fourth is missing its last row, seeing as I ran out of yarn – Twilleys Sincere Organic Cotton – (and began the fifth – in another colour) on the way to the shopping centre, so I did get to buy some more. I think when I (a) have money available and (b) have depleted my stash a bit more, I’m going to get enough to make myself a shawl or other piece of clothing with it. It really does drape beautifully. I really enjoyed the Hats & Hairstyles book, so I read the Shoes one too, and it is as good; I’m just more interested in headwear. The books aim to cover (briefly) the whole of known history, and are arranged more thematically than chronologically, so there is a double page spread on wigs, and another on flat hats, or on tall hats, with examples from a wide variety of places and periods. Most of the books of costume history I’ve seen (and I’ve looked through a fair few, by now) are more strictly chronological, or very focussed, so this way was interesting. The text in both is clear, readable, and flows well, so I’m looking forward to reading the rest of the series. Time to go – Good Shabbos! Unlike the rest of this series, which basically take a double page spread or two to give general information about the animal, and why one might or might not want one as a pet, this one is up to page 14 before it assumes you are getting one, and is still suggesting careful thought. It also has lots of pictures of snakes eating (dead – it strongly discourages live feeding) rats and mice, and doesn’t sugar-coat what is entailed. Snakes have the potential to be very dangerous, even the small non-venomous kind. Finally a picture of one of the potholders I’ve been working on. The green one and the pink one are now done (each in a single colour) and I’ve begun another in plain ecru (presuming I have enough of it). I’d like to do another each in green and pink, so there’s a pair for meat, milk and parev to give to my friends. I’m able to get one and a bit done on my commute (including both ways) at the moment, it seems, which is great.